The producer of this startlingly appealing album is Hugh Christopher Brown who is based on Wolfe Island. His studio is based here and works as a kind of collective for like-minded musicians. There are many here on the album. The studio is at the east end of Lake Ontario, while Toronto, where Jarvie is based, is on the west end. The lyrics, all by Jarvie, are special, as are the artist notes with each song. Both Jarvie and Chris Brown have managed to recruit here an impressive array of Canadian musicians. Anyone who appreciates music in general, and Americana music in particular, would benefit from investigating their background. This is confirmation, should you need it, of how important Canada and Toronto are for this style of music. Every song here is capable of producing a lengthy and interesting analysis. No space for that here. Rather, a dip in, an instruction to a listener to get the album and live with it, work it out, talk about it, and introduce it to as many people as you can. So, briefly: Try ‘The Core,’ a song and story whose details, along with Mickey Raphael’s haunting harmonica, proclaim these words: “White pine floor all covered with Blood,” “Still as the wings on a dead butterfly” and a “Two faced coin spinning in the sky.” This track, like all the songs in the collection, one needs to return to, again and again, just to hear, in this instance, Jarvie sings the words of fictitious Carrie Allanagh: “In this place, I have no name,/have no past, I feel no pain.” The use of internal rhyme draws the listener in, the echoing words capturing belief. In fact, Suzanne’s use of internal rhyme is beyond compare. ‘One It Finds’ deals with sorting life out. “So I went down to your world, with no name.” Following a John Wyndham type of mystery, but singing it in a matter of fact way, Jarvie is able, mysteriously, to give insight into the everydayness of life. A song, that when it fades, leaves a tear behind. Such is the magic of the performance. “I’m the one it finds.” The otherworldly mystery carries you along and haunts you powerfully. ‘All In Place’ is a song all about writing a song. Suzanne translates the process clearly and simply. An idea can appear in the everyday context of being up all night worrying, “waiting for a glimpse of me.” Then the process kicks in: “ a melody…then a harmony” and, as part of the process: “I pick a key.” But in composing, the process can go astray. So… “You make friends with regret/ You go down by the riverboat, you never get wet.” And to conclude precisely, “In the end you pay for what you thought was free-/Now its all in place – we pick a key.” Magic. And all backed up by Jason Mercer’s banjo, Joey Wright on mandolin, and Michael Quattrone, a noted New York City area retreat leader, poet, and musician, providing background vocal. 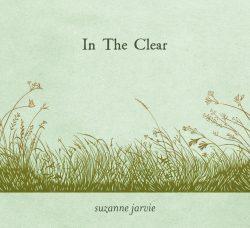 ‘Triology,’ the last song in this collection, echoes with personal reflection, the second part, ‘Northumberland County,’ “so green and forgiving” finalising Jarvie’s total involvement with her subject, and that ability to move an audience. Outstanding and original. Two records down, here is a new major singer of note on the block. Listen, think and learn.